The reallotment programs of the 19th century had a profound impact on the landscape of the Bjäre penisula as it changed the traditional enclosure and land use system completely. Maps from the 19th and 18th century have previously proved to be a most useful tool when analysing landscape change during the last 300 years. Large scale village maps prior to the allotments gives a snapshot of the former landscape structure and provide valuable information on landscape features such as land use, vegetation, roads, settlements and ancient monuments. In some cases the 18th and 19th century maps also makes it possible to reconstruct early medieval or late iron age phases of landscape development. Large scale maps from the 18th and 19th century from the Bjäre peninsula have previously been manually transposed and rectified a modern map datum on film showing basic land use, roads, villages and enclosure borders. This information has been digitized as vector data in Arc View. Several different kinds small scale maps are also used within the project to analyse changes during the 19th and 20th century. The smal scale maps have been scanned as raster images and then georeferenced to a common coordinate system in the Arc View extension Image Analysis. The different kinds of GIS data have initially been used for visual comparison. This has proved to be a most valuable tool when mapping relict vegetation refuges in the present day landscape. Since it would be to time consuming and expensive to digitize the different kinds of maps as vector data sets for the whole peninsula, smaller sampling areas have been chosen for digitalization and quantative analysis. Vector data based on large scale village maps from the 18th and 19th century, showing enclosure structure and main land use. Four cadastral map sheets from the early 20th century showing the Bjäre peninsula. Cadastral map from the early 20th century showing one of the sample areas, Drängstorp. Green polygon added, showing the village area. 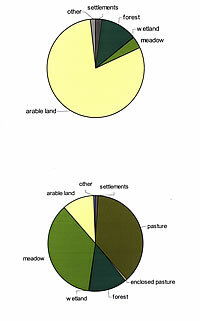 Pie charts showing land use during the 1700th century and 1920.